Parents League of New York supports families and children by providing a broad range of educational and parenting resources. Each year we draw on our unequaled experience and affiliations to develop and offer a wide array of printed and online publications. Parents League Review: All members receive a copy of the latest issue of the Review, our annual journal on education and parenting. Learn more about the Review. This publication is also available for purchase. $25.00 plus $4.00 shipping. Purchase online, or call our office at 212-737-7385. 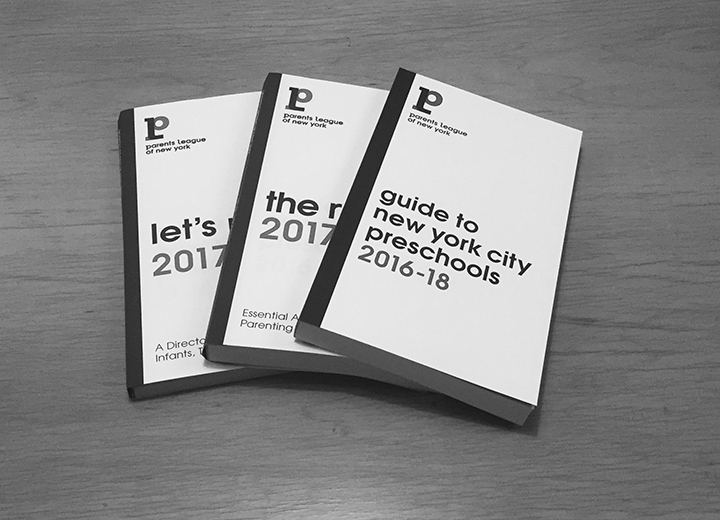 Guide to New York City Preschools: The only annually updated New York City preschool guide with nearly 300 listings. Families with young children receive this publication with membership. Let's Play: a comprehensive listing of activities for infants, toddlers and preschoolers. Families with young children receive this publication with membership. Online School Directory: Featuring over 300 Parents League Member Schools including independent and private preschools, elementary schools, middle schools, high schools and special needs schools in New York City and the surrounding area and boarding schools across the country and abroad. Parents League Review: All members receive a copy of the latest edition of the Review, our annual journal on education and parenting in January. Learn more about the Review. This publicaion is also available for purchase to the public. $25.00 plus $4.00 shipping. Purchase online, or call our office at 212-737-7385. Parents League also provides a searchable directory of member schools to family members. Not a member? Join today to access the Parents League School Directory.